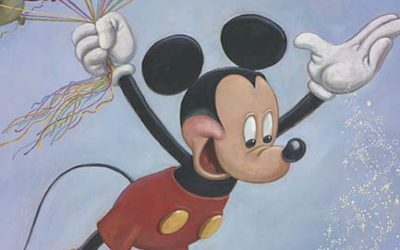 The “mouse that started it all” is turning 90 and a new birthday portrait was recently revealed at San Diego Comic-Con. Titled “Spreading Happiness Around the World,” the painting by legendary Walt Disney Animation Studios animator Mark Henn honors Mickey’s 90th anniversary. Mickey Mouse was given birth by Walt Disney in 1928. Over the years, this iconic cartoon character has evolved many times. 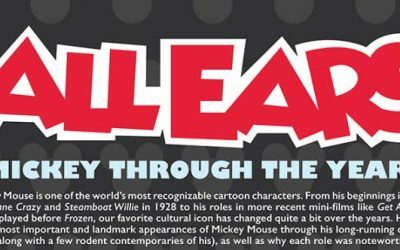 In the following infographic, Shirts.com explores Mickey’s roots in Oswald the Lucky Rabbit to the Mickey Mouse Club television series to video game appearances in Kingdom Hearts and Epic Mickey. 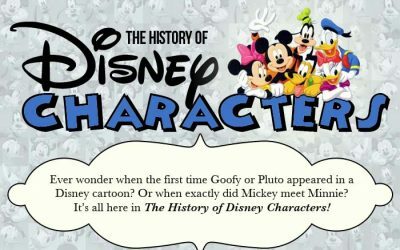 Goin2Travel.com, who recently brought us a “Visual History of Mickey Mouse,” has now put together this fun infographic that takes a historical look back at some of the most iconic Disney characters throughout the years and how they got their start. 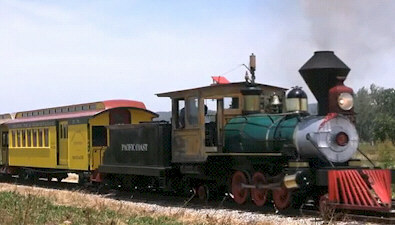 The Disney History Institute is making their first documentary in a video that showcases Disneyland as it was in 1955 and includes a trip around the park on the original Disneyland steam train and passenger cars. Wally Boag, who played Pecos Bill in nearly 40,000 live performances of the Golden Horseshoe Revue at Disneyland, passed away Friday at the age of 91. 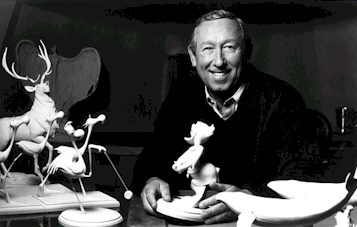 Boag, a Disney legend, originated the role for Walt Disney in the stage show that is listed in the Guinness Book of World Records. He was also the voice of Jose in The Enchanted Tiki Room at the theme park. Priscillano “Pres” Romanillos, the animator who brought to life the athletic Native American Little Creek in DreamWorks’ “Spirit: Stallion of the Cimarron” and the evil Shan-Yu in Disney’s “Mulan,” has died. He was 47 years old. He died at his home in Tujunga on Saturday, surrounded by his family and friends. On July 18, 1955, Disneyland officially opened its doors in southern California. 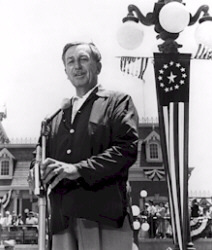 Now, fifty-five years later, a rare gathering of Disney Legends, family members, former executives (2 Disneyland Presidents), Imagineers and other special guests will be gathering in San Francisco at the new Walt Disney Family Museum – many of whom will share their personal stories about working with Walt. Eddie Carroll, the voice of the beloved Jiminy Cricket, passed away yesterday, April 6, 2010 with his family at his side. He was 76 years old. Eddie had been the voice of Jiminy Cricket since 1973, a role he assumed after Cliff Edwards, the original voice of Jiminy, died in 1971. 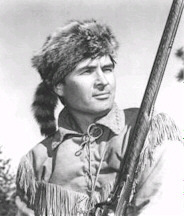 Fess Parker, a 1950s idol who launched a craze for coonskin caps as television’s Davy Crockett, died Thursday of natural causes. He was 85. Family spokeswoman Sao Anash said Parker, who was also TV’s Daniel Boone and later a major California winemaker and developer, died at his Santa Ynez Valley home. 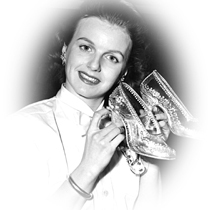 Sadly, His death comes on the 84th birthday of his wife of 50 years, Marcella. Roy E. Disney, the nephew of Walt Disney, has died from cancer at the age of 79. Roy was born in 1930 and worked for the company as a writer and producer. However his most important influence was as a Disney shareholder who led two investor revolts. The Walt Disney Family Museum announces its schedule of events for the month of December, highlighting the premiere of Christmas with Walt Disney, a special holiday film showcasing Walt Disney’s Christmases past. Additional events include a concert by the String Circle Quarter and a candlelit Christmas program with the Artists’ Vocal Ensemble. Read on for the schedule of events sure to delight guests of the museum. The Walt Disney Family Museum is jump starting the holiday season with a series of screenings and lectures. Highlights include screenings of Sleeping Beauty in the Museum’s 114-seat auditorium and the premiere of Christmas with Walt Disney, a special holiday film showcasing Walt Disney’s Christmases past. John Blackstone of CBS Sunday Morning News joins Diane Disney Miller and takes viewers on an insightful video tour around The Walt Disney Family Museum, which officially opens tomorrow, October 1, 2009 in the Presidio of San Francisco. 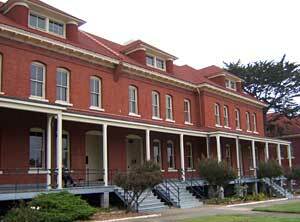 Built for approximately $110 million by the Disney family, the museum resides in the Presidio District of San Francisco in the converted barracks of an old Army base.